The HTL8255 is a synchronous implementation of the industry standard 8255/82C55 Programmable Parallel Interface(PPI) adaptor. The PPI can be used for a wide range of parallel I/O interface tasks. The PPI provides three 8 bits parallel I/O ports (Port A, B and C) that can be configured in 3 different modes. In mode0 each one of the three 8 bits ports can be programmed as either an input or as an output port. 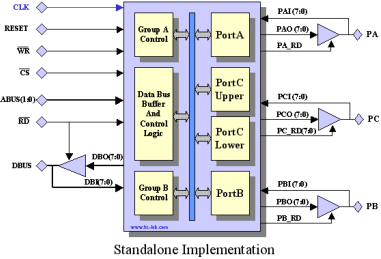 One of the ports (PortC) can be split into a 4 bits input and a 4 bits output port. In mode1 the ports can be programmed as a strobed I/O port with part of PortC used for handshake and interrupt control signals. The final mode2 is used for strobed bi-directional I/O with some of PortC signals used for handshake and interrupt signals. The HTL8255 is delivered in synthesizable VHDL source code. The source code is fully documented and can be synthesized using any modern synthesis tool. 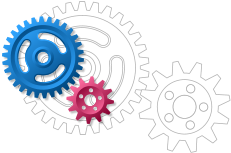 A self-checking VHDL testbench is included which verifies the 3 operating modes. For evaluation the HTL8255 can be supplied on a low-cost FPGA development board from Enterpoint Ltd. The HTL8255 is instantiated together with the 80186 processor, a 16550 UART and 40Kbyte of SSRAM. No VHDL source files will be supplied in this case. Note: The original 82C55A semiconductor device does not have a clock input and as such the HTL8255 + Craignell40 board can not be used as a replacement without adding a clock.